Description: On a drab day NS 9357 leads 4 other engines across Westfield viaduct heading westward. Description: Southbound manifest rolls through Dalton on a rainy spring afternoon. Description: 11J rolls downgrade passed the feed mill at Bloomsbury. Description: Norfolk Southern 9357 leads a mix of Union Pacific and CSX power on a westbound freight at Milepost 215. The sections of track set along the right-of-way behind the train are part of the project to replace the crossover that was destroyed on October 30, 2004. Description: NS 21M with another Conrail leader at 12:05PM. Description: A zoomed out view of 21M. Description: NS local H3A shoves east at Conte Luna toward CP King to make the connection to the Dale Secondary behind the usual -9's. 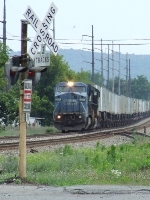 Description: An intermodal rolls past CSX's Wauhatchie Yard near Chattanooga. Description: Holding at Pike waiting for clearance into the Garden Yard. Description: All's quiet in Track-2's siding. Description: NS #9357 at Charleston Harbor's Intermodal facility awaiting orders. Description: As 34A passes on track 1, eastbound stack train 214 flies east. The head end of 34A can be seen in the distance. Description: Catching a 40-mile per hour train in a patch of sunlight only a few feet in length requires either some precise timing or the use of burst mode. This time the former option worked well enough to at least keep the front of the engine clear of shadows. Title: NS 214 prepares to go the "...back way..."
Description: NS 214 has received its Form D and prepares to head down the Port Reading Secondary. Description: NS D9-40CW 9357, 9871 & 9462 lead a westbound stack train.